What is a Bobo Tichel Volumizer? If you cover your hair with a cloth head covering (tichel), you'll be happy to hear abou the new Tichel Volumizer, or Bobo. A volumizer is a hat that you put on your head before putting on your tichel to help you add a foundation for designing the finished look of your tichel wrap. Some tichel volumizers have a built in anti-slip headband attached inside, to help prevent slippage. Those that don't, rely on the elsatic material to keep your bobo from slipping off. Actually, the tichel volumizer can not only be worn under a tichel and head scarf, but also under wigs, snoods, pre tied bandanas and everything else between! Try a bobo today and see what it can add to your wrapping creativity. It's as simple as putting on a hat. Whether you have short hair, long hair, or no hair :( the bobo is the perfect accessory for you! They are usually made very lightweight so it doesn't add a lot of weight to your head load. They are usually made one-size-fits-all, and some also have an adjustable hook or closure. Depending on the material the bobo or tichel volumizer is made from, will determine how you can keep your bobo clean and odor free. Most are machine washable in a cold gentle cycle, but some may require hand washing. Check with the seller before buiyng. Check out our entire line of headcoverings at the link below, where you will also find shawls, Berets and Caps, Hats, Headbands, Accessories, and more! We'll be happy to hear your feedback on this article, you can comment below, and it'll be super shtotty if you like our post, and/or share our site on your favorite social network! Megillah 102: Why We Wear Purim Costumes? The holiday of Purim is insignificantly significant. The miracles of the Purim story were very indirect and hidden. In fact, the only time a person can see how great the miracles were, is after reading the entire Purim story. Only when completing the full story, do all the pieces of the puzzle come together. G-d disguised himself as a villain, making it seem like he was going to destroy the Jewish nation. In the end, however, he destroyed the very people who were trying to annihilate his children. In honor of this, we wear costumes, to commemorate the idea of a blessing in disguise. Note: We can learn an important lesson from this: When a person’s actions seem wrong, they are not always so. It is important to judge people favorably. When Mordechai initially wore sackcloth and went into mourning, god arranged for a swap to be made. Haman ended up guiding a royal horse with Mordechai sitting on it, wearing royal clothing. To remember this “mix-up”, we dress up in clothing we wouldn’t normally wear. On Purim, there is a positive commandment to give money to the poor. On this day, many poor people raise money for their families. In order to save them the embarrassment, we all dress up in different clothing, so no one needs to know who the collector is. Another reason why costumes are important is the reality of a costume. On a regular day, it may seem that people are valued according to the way they dress or speak. On Purim, we disguise ourselves and many of us drink wine. These actions help us realize that we aren’t our cover or our outsides. We are however our personality and souls, and we are valued according to our efforts, not according to the way we look. These costumes are beautiful. There are, however, some who create extremely creative costume ideas. There are those who dress up as authority figures, such as policemen, firemen and superheros. There are others who dress up as famous characters they idolize. There are those who are from more protective homes, who are usually given only a few options of dressing. Many times they use Purim to dress up as someone their parents generally would not approve but would flip their opinion on this day just as the Jewish people’s fate flipped. Many times it’s is the other way around. Children from completely liberal homes will dress up as someone very orthodox. In conclusion, Purim is an amazing opportunity to get to know yourself, your family and your friends in a very real way, and costumes play a large role in this. The menorah is most commonly known today as the candle holder or lamp with 9 branches that is lit in the Jewish tradition on the festival of Hanukah. Hanukah is on the 25th of the Hebrew month of Kislev, which usually falls sometime in December on the solar calendar. The basic design of the menorah is to have 8 branches of equal height and the 9th to be taller. This taller one is called the shamash which means helper in Hebrew. This purpose of this light is to “help” because the remaining 8 lights are not supposed to be used for any purpose except to admire their beauty. Where does a menorah come from? Menorahs traditionally only have 7 branches, and were used in the ancient Jewish temple in Jerusalem, which was the center of national and religious life. The Greek empire invaded and tried to destroy the temple, but after the Jews were able to come back and found inside online one jar of oil to use in the menorah. The oil should have been enough for one day but instead burned for 8 days, until they were able to make more. This event is commemorated with the festival of Chanukah and the additional lights on the menorah to represent all 8 days. What does a menorah look like? A menorah should follow some basic guidelines, but can take almost any shape or design. Traditionally, they have straight or curved branches of the same height, with the shamash in the middle or behind or on the end, and slightly higher. 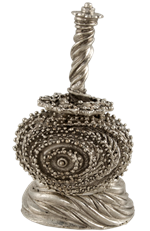 The original menorah was made of gold, but today common materials include silver and glass. Many artist use clays and ceramics to design ornate and beautiful pieces which do a fabulous job of spreading the joy of the miracle of Hanukah. Electric menorah can also be seen in many homes and windows with bulbs that light up for each day of Hanukah which also are a beautiful addition to the holiday. How do you light a menorah? The menorah should be lit in order from right to left. The first night the candle to the extreme right is lit. On the second night, the two candles on the extreme right are lit with the new candle going first. This continues until the last night all 8 candles are lit, plus the shamash. Many families have varying traditions for where and when to light but the most common includes the whole family gathering at sundown, outside, in the window, or a table at the entrance of the house. The head of the house pronounces a few blessings, then lights the candles, while the family sings traditional Hanukah songs together as admiring the candlelight. Dreidels are a fun toy, similar to spinning tops, that are played with during the holiday of Chanukah. The word is derived from Yiddish, which means “to turn”. It has 4 sides and each side has a different Hebrew letter. In the diaspora the letters are nun, gimmel, hay, shin. Which stands for “Nes gadol haya sham”,(A Great Miracle Happened There) In Israel the final letter shin (there) is replaced with pey (here). The miracle referenced is the oil, which was supposed to be enough to burn for only one day, but continued to burn for 8 days. This happened in the Temple in Jerusalem, explaining the changing of the last letter on the dreidel in Israel. The finding of the oil happened after a number of oppressive decrees were places upon the Jews, ongoing warfare between the Hasmoneans and the Greeks, and an all but destroyed Temple. In most parts of the world Chanukah falls during the winter season and children are kept indoors to avoid the cold air in the nights. The dreidel has helped to occupy Jewish children for hundreds of years. Where do dreidels come from? It is not perfectly clear where or how the game was established. It is likely it was adopted from other spinning top games with the added characteristics of chanukah. However, there is a nice tradition that during the time of Chanukah, the Greek empire invaded Israel and outlawed the study of torah. The Jews resisted and continued to educate their children, but when the Greeks patrolled their homes, the children needed a cover for their learning, thus they pulled out the dreidels and pretended to be playing games. This contributes to another origin of the games since Chanukah shares the same Hebrew root as Chincuh, meaning “education” and the children sacrificed everything in order to continue their education. The game that accompanies dreidels requires each child to have coins or chocolates called gelt. After the dreidel is spun each of the 4 sides have a different consequence, depending on which one it lands. The nun causes no action, the gimmel allows the player to take all the coins in the pot, hey allows the player takes half the coins, and shin/pey they put everything in the pot. The game is won by the final player with coins still in the pot, after the others have been eliminated. The minimum number of players is 2, but there is no maximum, in fact the more the better! Today dreidels have become perhaps the best-known pastime during Chanukah. It does not require abundant skill to spin or to play by the rules. So, starting from a young age, children can play. Dreidels come in many colors and sizes that are sure to catch the interest of any child. Additionally, like many things in Judaism a precious lesson is to be learned and remembered while the game is played, and that is the utmost importance placed upon education. What does "Tu Bishvat" mean? Tu Bishvat. The 15th of Shevat. Shevat, the fifth month of the Hebrew year. The letters used to count 15 are Tet and Vav. Tet equals nine, and Vav equals six. Add them together and you have fifteen. Tet and Vav spell out “tu”. Hence, “Tu Bishvat”. There are four “New years” in the Jewish calendar. Each one signifies a different beginning. The main one is “Rosh Hashana”, New years day. This is the beginning of the year for seasons. Most laws pertaining to yearly changes start and finish on this day. This occurs on the first of Tishrei. The next one is our Tu Bishvat, which as we said, occurs on the fifteenth of Shevat. This is the new year’s for trees and plants, or as fondly sung in Hebrew, “Chag La’ilanot”, the festival for the trees. The next new year’s on the list is the first of Nisan. This is the new year for the Jewish nation, as the redemption took place two weeks after this. It is also the new year for Jewish kings. The last new year's is the first of Elul. This is the new year for cattle. The obligation to tithe the cattle was measured yearly on this date. How do we celebrate Tu Bishvat? We get together and sample exotic fruits to commemorate and celebrate this special day. If trying a fruit for the first time in a year, the “She’hechiyanu” blessing is required. The blessing, translated, means: Blessed are you, god, our god, the king of the world, that you have let us live, kept us and brought us to this time. We make this blessing when doing many things that we haven’t done in a while or things we haven’t ever done, like buying a new suit or a new house. Why does this mean anything to us? Humans are compared to trees in the bible, and the torah is compared to water. Because much of our lives are comparable on a deep and meaningful level of understanding, this festival is very significant to the meaning of our lives. Where can I purchase the right fruit? This has been cleverly arranged by people in the Jewish community who create special fruit platters containing the right amount of fruit, cut nicely into portions, arranged beautifully and including everything you need. There are many varieties and sizes, ranging from dried fruit to fresh fruit. Some platters are also served on designer Tu Bishvat gift plates which can be used year round to serve fruits. The Jewish festivals have many enjoyable activities to help you savor the taste of Judaism- no pun intended. Enjoy your holiday, and if you’re short on time purchase a Tu Bishvat platter by contacting someone in your neighborhood. Yom Kippur is the day of atonement on the Jewish calendar, it concludes the High holidays which started 10 days earlier with Rosh Hashanah. Yom Kippur is considered the holiest day of the year, where in Israel the country virtually stops, including the airport. The day is reserved for intense prayer, fasting, and has a somber feeling. It is called the Shabbat of Shabbats in the Torah and the restrictions of Yom Kippur are similar to those of Shabbat, plus a few extra. We say that on Yom Kippur the entire world is forgiven for any wrongs they have done in the year. When the sun sets everyone starts on a completely fresh slate for the upcoming year. The day contains numerous significant events in history, and in Jewish philosophy it teaches that the day itself contains the holiness, and we have an opportunity to tap into it. The day of Yom Kippur is dedicated to prayer. Yom Kippur begins with the Kol Nidre prayer just at nightfall, which is the annulment of vows of the individuals and community. It is chanted in a slow tune in which all members participate and reflect on any promises they may have made in the past year and not kept. The following day’s prayers consume the majority of the day until nightfall. 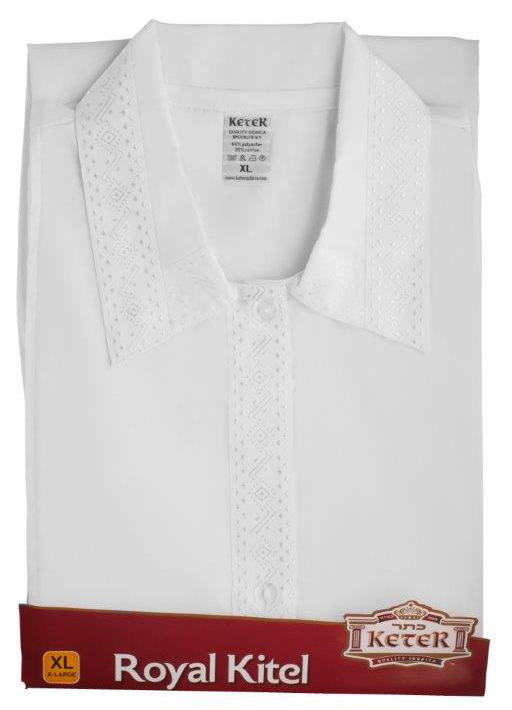 There is a custom for Ashkenazim to wear their Kittel from their wedding day, and wear white in general. Additionally, we stand as much as we can in the day. The significant is that on this day we are likened to angels, since we do not rely on physical sustenance (food), dressed and white and standing as the angels do. There are several restrictions on the day of Yom Kippur. Fasting is the most well-known, and for 25 hours people refrain from food, beverage, even washing hands unnecessarily and some brushing their teeth. The day of Yom Kippur is filled with such a high level of holiness that we attempt to distance ourselves from physical things if it will not be a danger to our health. Other restrictions are people do not wear leather shoes, using creams or oils, and avoiding intimate relationships with our spouses. There is a universal custom to submerge in a mikvah before Yom Kippur starts. The Mikvah is a symbol of purity in the Jewish faith and allows us to connect with our inner soul which is pure. Individual and national responsibility are two major themes of Yom Kippur. Any wrongs that have been committed against fellow man, we can only be forgiven in heaven if we first ask for forgiveness from that individual. Any wrongs that are between man and his creator can be forgiven on the day of Yom Kippur as well. These ideas bring the nation of Israel closer together in a sense of community and working towards the same goals to improve ourselves and the world. The sukkah is the foundation of the holiday of sukkot. It is designed to be a temporary dwelling and all major activities should be done inside of the sukkah instead of the home. For 7 days families sleep, eat, read, play, and relax inside the sukkah. The sukkah can be built a few different ways and from various materials and sizes as long as it fits within the requirements laid down by Jewish tradition. The most important aspect is the roof, which must be made from something natural like leaves, branches or similar. There is also a special point to make sure in the night the stars can be seen through the roof. This helps to remind people that it is a temporary dwelling. Despite it being somewhat fragile and not permanent there is still a sense of security in the sukkah as we are reminded that our creator is the one who supplies the security, and not our actually home with cement walls and strong roofs. In the holiday of Sukkot there is a mitzvah to wave the 4 species; the lulav, Etrog, willow and myrtle. Each year people carefully select their 4 species to make sure it is as beautiful and complete as possible. They are held together during the morning prayers either in the sukkah itself or in the synagogue and waved in 6 directions. This is symbolic gesture to show in each direction g-ds presence exist. Each of the 4 species represent a different type of person in the nation of Israel, as each specie is quite different from the other. But the mitzvah is only fully complete when they are all held together touching one another in unison. The sukkot festival can also be referred to as the harvest festival. In the fall season Is the harvest time for many crops in the land of Israel. It was a celebratory time when farmers harvested their crops to bring to the markets. Long days each season are spent tending to and harvesting crops in the summer heat. These actions can lead people to think they have the power over these crops, that their actions alone produced the grains, fruits and vegetables. The timing of sukkot in addition to the use of the 4 species and living in the sukkah to help remind individuals that their creator is also the creator of the world, and without his assistance there would be no harvest. The conclusion of the Passover holiday leads right into a long 7-week period known as Sefirat Haomer. It translates as counting of the Omer, which in the days when the temple stood in Jerusalem was a barley offering which people made. The period last for 49 days from the first night of Passover until the festival of Shavuot. During this time the Jewish people are required to count out loud each day, until the final day. The day can be counted from sundown which is the start of the day on the Hebrew calendar. The Sefirat Haomer is a very special time in the Jewish calendar. The number 7 falls into the natural order of things, there are 7 days in a week (with the 7th being Shabbat) 7 days to Passover, 7 days to sukkot, and now the 7 weeks. Jewish sages have pointed out that these days connect the festival of Shavuot (the only festival which is one day) to Passover, making it as if it was one long holiday. There are other sources that explain that when the Jewish people were in enslaved in Egypt they fell to the 49th level of impurity, and each of the 49 days of the Omer purifies and elevates the Jewish nation. It ends for Shavuot which was the day the Torah was received at Mt. Sinai and one of the primary reason for the exodus as well as to dwell in a land of our own. The Sefirat Haomer is a time for preparation and introspection to reach the spiritual and physical turnaround of going from slaves to freemen. There are a number of customs which have developed over the centuries during Sefirat Haomer. One of the most significant of which is the remembrance of the death of the students of Rabbi Akiva. He was a major figure in Jewish history and mentioned repeatedly in Jewish holy books. There was a plague lead to the death of tens of thousands of his students. To mourn their deaths Jews today follow the custom of refraining from certain activities during the Sefirat Haomer. These include cutting of hair and listening to music since theses are identified as joyous activities. In this time also, many Jews study the Pirkei Avot (Chapters of our Fathers) an compilation of ethical teachings. Lag Baomer is the 33rd day of the counting of the Omer, and is a celebratory day, remembering the death of Shimon Bar Yochai. Traditionally these days are not celebratory but for great influencers in Jewish history like Shimon Bar Yochai, they are indeed festive because of their contributions. Shimon Bar Yochai was a leading authority who revealed some of the deepest secret of Kabbalah or Jewish mysticism through his book The Zohar. The Zohar is essentially a commentary on the Torah which focuses on spiritual aspects of the soul, nature, and the physical relationships with the spiritual. This day is celebrated with Bonfires since fires have always been symbolic of the soul, always reaches upwards. Rosh Hashanah is the Jewish new year. It translates literally as “head of the year” and the holiday acts as both as introduction to the following year as well as a conclusion to the previous year. Since the destruction of the second temple Rosh Hashanah has always been celebrated as a 2-day holiday. Rosh Hashanah is the celebration of the creation of the world. More specifically It is a celebration of the creation of the soul of Adam. Because of the festive and spiritual nature of the day it is when people gather with family and extended family for joyous meals and intense prayer. On this day the nation of Israel declare that G-d is their king and many parts of the days’ customs focus around this aspect. There are several names that Rosh Hashanah also goes by including Yom Teruah, which means day of the shofar blast. One of the most significant aspects of Rosh Hashanah is hearing the Shofar. The Shofar is a made from the horn of a ram, and Is a traditional instrument used for all of jewish history. It is the most important mitzvah of the day and the one thing that people often go out of their way to accomplish. The shofar is used to remind us of the coronation of a king, since on this day we declare G-d as king. The sound also is synonymous with wailing or crying, to represent the intense yearning that the soul feels to connect with its creator and reflections on the last year. There are certain foods that are included in the festive meals on Rosh Hashanah. Perhaps the best known is apples and honey, which can be found on virtually every Rosh Hashanah dinner table. The apple is dipped in the honey to represent a sweet year that which strive for. There are a number of other foods, like fish, pomegranates, and carrots that all have special symbolism for our desires in the upcoming year. Instead of the traditional shaped braided Challah bread, we eat round spiraling Challah to represent the cyclical nature of the year, yet with each spiral we are slightly elevated to a high level. Tashlich is a fun prayer in which people go to a natural body of water and symbolically cast their mistakes away into the water. It is a very popular ritual and has text in the prayer book which are recited in the experience. Rosh Hashanah is the start of a contemplative time known as the Yamim Nora’im or High Holidays. The 10 days that start with Rosh Hashanah and end with Yom Kippur are set aside for intense reflection and goal setting. We take this time to approach those we might have hurt and request forgiveness. We attempt to realize areas in our own life’s where we could have improved on, and to grow in the next year to be the best version of ourselves. Passover (Pesach) is one of the three Jewish festivals in the year. It falls in the beginning of the Spring season usually and last for 7 days with a holiday one the first day and the seventh, with 5 days of “Chol Hamoed” in the middle. It is known throughout the Jewish world for the Matzah food, the fun Seder, and a time spent with family remembering our roots and common ancestry. Passover always falls on the 15th of the Jewish month of Nissan. This date is the date that the Jewish people were drawn out from Egypt after a series of miraculous events. For over 200 years we were enslaved by pharaoh and the Egyptians. We were forced to do back breaking work and forbidden to practice many of the mitzvot. In a time when nearly all hope was lost, we left Egypt which such haste that we did not even allow the bread to properly rise before leaving. In prayers Passover is referred to as the time of our freedom, and the entire holiday is full of this idea. Jewish tradition teaches that it is one of the Jewish new year, like Rosh Hashanah which is the new year for the world, while Passover is the new year for the Jewish nation. Matzah in today's world has become a symbol for the entire festival. Matzah is baked flour and water which must be complete in less than 18 minutes which is the time it takes for the dough to rise. It is typically circle or square and the most common type is hard like a cracker. The greatest mitzvah of Passover, aside from refraining from any foods that do contain leavening, is to eat matzah on the first night of Passover. One reason why is to remind us that sometimes when a great thing comes along (like freedom) no time should be spared. 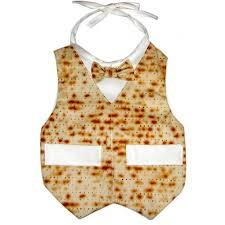 Additionally, matzah is like the humble mans bread, since it lacks significant flavor, it helps remind us of our beginnings despite many luxuries in our lives. The Passover Seder follows step by step instructions passed down for over 2000 years. The book to accompany the Seder Is called the Haggadah and describes the events of being taken out of Egypt. There are many customs that families do during the Seder and endless songs that keep the children interested. One centerpiece of the Seder is the Seder plate which contains specific foods following the theme of the festival, like maror, and charoset. There is even a cup of wine left on the table for Eliyahu the prophet, who, tradition says, will come to announce the coming of the Messiah. The Seder is acted out by Jewish families around the world in excitement as we recognize that Passover was the start of a nation who were elevated to receive the Torah shortly after and because of this, thousands of years later, we are still a cohesive people. The coming of age ceremony in the Jewish tradition is an exciting and meaningful event. Until the age of 13 for boys and 12 for girls, children are not considered bound by the commandments as laid out in the torah, at least not to the same level as adults are. The age of 13 in Judaism is when boys are expected to use tefillin and pay extra attention to the mitzvot that concern them the most. The same goes for girls, that after 12 they have certain mitzvot they are responsible for being extra careful about. This is the age when children are considered to be self-aware enough to know their responsibilities in the Jewish religion and with the Jewish people. That is where the name is derived from which literally means son of/daughter of the mitzvah. It is also a very fun time because of the celebration of taking on this responsibility. Gifts for the bar/Bat mitzvah are also important for the guest to remember. Emphasis should be placed on Judaica and especially Judaica relevant the mitzvot. Since boys start wearing tefillin, bags to hold the tefillin or protective cases are a nice idea. Kiddush cups, siddurim, among other things are also good since boys are starting to use or participate in activities like these. 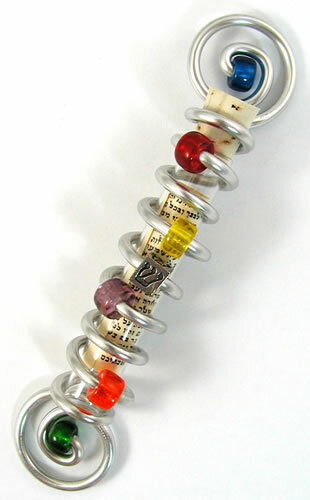 For girls a siddur is also a great idea, along with Shabbat candle stick holders. 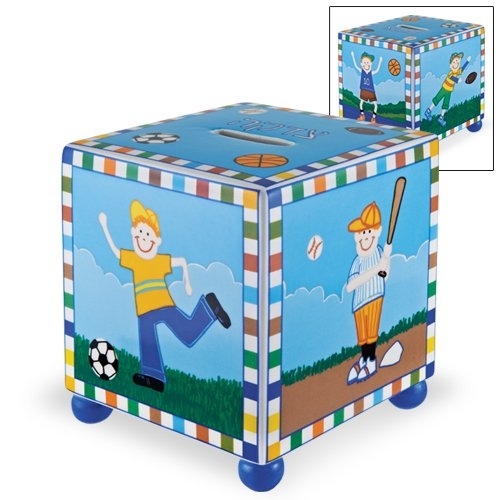 For both genders tzedakah boxes are wonderful because the importance of giving back to those in need but also because how beautiful they can be. The centerpiece at a celebration can a very memorable object. Tables for the celebration can be organized in such a way where families sit together, groups of friends or any other way. On each table is the centerpiece that ads significant flare and fashion to each table. Centerpieces can be any collection of colors, and sometimes contain candles, stones, pictures or nearly anything. Flowers are a most popular selection whether live or fake flowers. The décor of the celebration should only add to the sense of holiness for the new adult. Pride and accomplishment are feelings which they feel along with their parents. When a son receives his first Aliyia to the torah the father says a special blessing signifying the transition of maturity and responsibility. 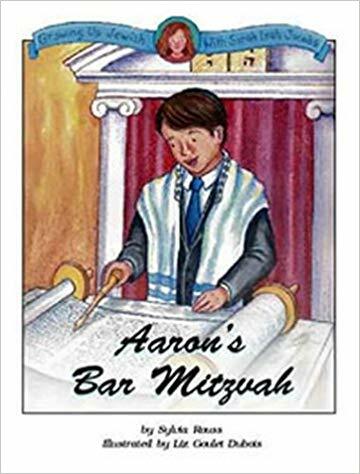 The focus is on the bar/bat mitzvah and their decision to follow in the footsteps of their ancestors before them and following the ways of the torah. Seder Plates 101: What Is It? Why Do We Use It? What is a Seder plate? On the first night of Passover, Jewish families get together for a Seder. The word Seder literally means order. This is because the Seder is written in a special order, numbered 1 through 12. In these 12 categories, different parts of the exodus from Egypt are re-lived, and there are celebratory services too, such as eating, drinking wine, and blessings. During the Seder, leavened bread, or regular bread, as we know it, is forbidden. This is in memory of the Jews leaving Egypt, who couldn’t eat leavened bread, as there was no time to let it rise. Instead we eat matza. Matza is a cracker-like bread which has not risen for more than 18 minutes before it is fully baked. The matza is placed alongside or within the iconic seder plate. 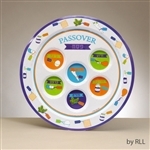 This “seder plate” contains important symbolic foods that are given out to eat, show and discuss during the Seder. 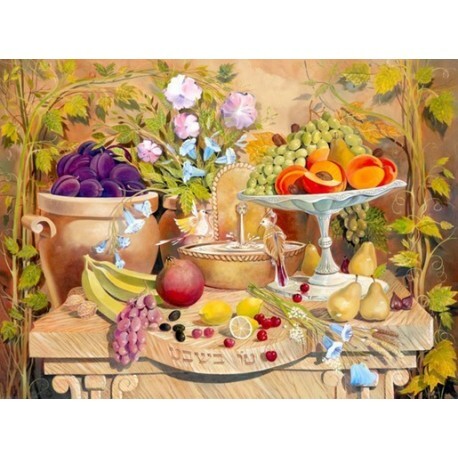 Our sages teach us the importance of beautifying our seder and therefore the practice is to place all these symbolic foods on a special plate. What does a Seder plate look like? Charoset - A special blend, symbolic of the cement used to build the pyramids. Zeroa - A piece of roast lamb, symbolic of the Korban Pesach, the sacrifice of Passover. Some Seder plates, however, are more detailed. These Seder plates have three floors, and a roof. On each floor are matzot. (Matzot is plural for matza). The three floors are symbolic for Abraham, Isaac and Jacob, the three patriarchs. Each “patriarch” is used for a different part of the Seder. The six aforementioned symbolic food items are placed on the exposed roof of this layered plate. They own the seder plate “penthouse”. This Seder plate is simply majestic. 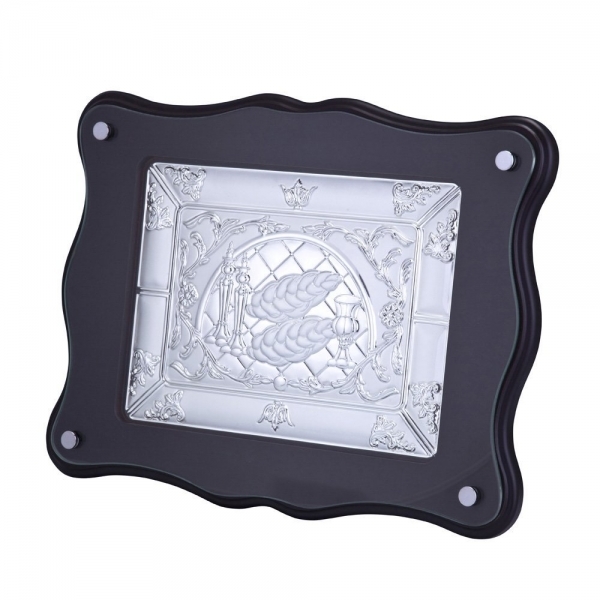 It is usually silver, though there are many different designs and materials used in making this type of seder plate. It is magnificent. Why buy a Seder plate? Our sages taught that when someone glorifies and beautifies judaism, god rewards them greatly. What better way to glorify god’s name, show gratitude for the exodus and celebrate the re-birth of our nation than by having a masterpiece of a seder plate at the front of the table on Seder night. Exploring The “Ketuba” - A Jewish Prenup: What It Is and How It Works. A Ketubah, the Jewish prenuptial agreement, is a document that needs to be signed by two Jewish witnesses. The name of both the groom and the bride as well as their fathers must be written on the document. What it states, in short, is the agreement of the husband to provide clothing, a roof, and a woman's needs for his new bride. Unlike the prenuptial agreements our society is used to, the Jewish version is designed solely to protect the bride, and hold the groom accountable. 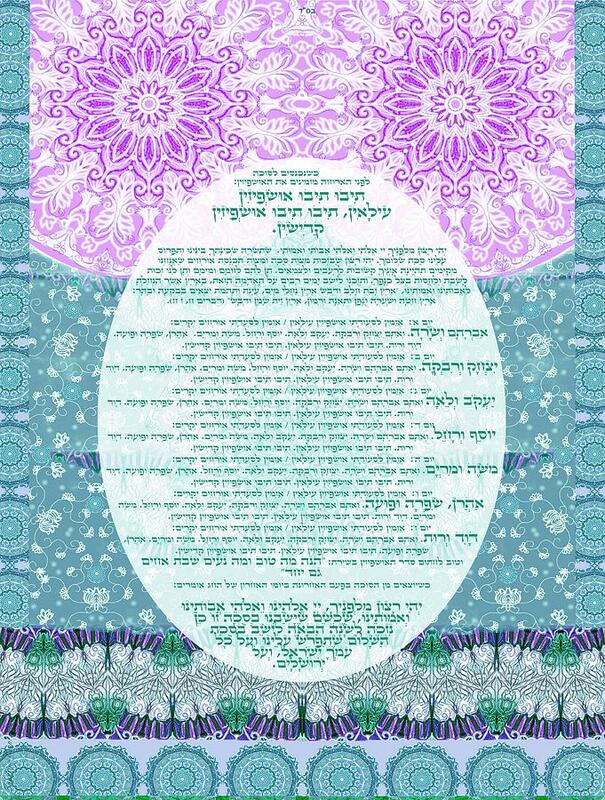 A Ketubah is very holy and important. Many people hire someone to decorate it beautifully to emphasize how very sacred it is. According to Jewish law a couple may not sleep in the same house if they don’t know where their Ketubah is located. Where to get a Ketubah? A Ketuba can be bought at a Judaica store. 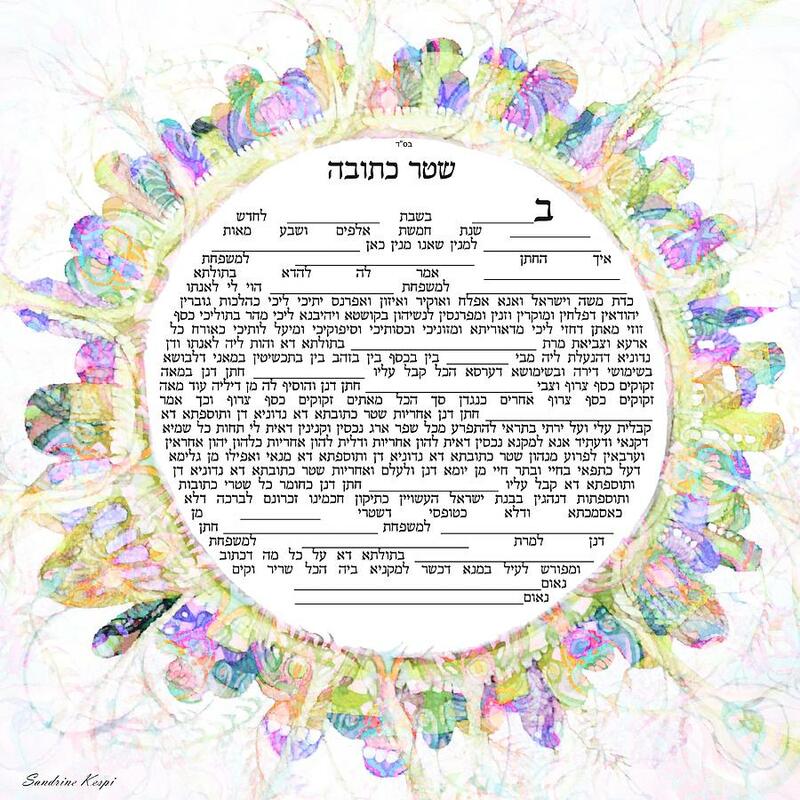 Today, a Ketubah can also be purchased online, at an online Judaica store. At a Judaica store, you will find all sorts of Judaica, such as, mezuzot, shofars, tallitot, prayer books, menorahs, and many other holy items, including a Ketuba. What kind of Ketuba should I get? There are many kinds of Ketubot. Some people get small, simple ones. Some people get complicated, artistic Ketubot. Some like theirs big, some like them small. Some people even have someone who knows “Kabbalah”, mystical interpretations of the bible, inscribe some very mysterious phrases on the sides. There are also artists that have a knack for the Kabbalistic perspective on art and can combine the two together. How does the artist work with the script? There are many ways to work with the script. Sometimes, an artist can draw art around the script. Other times, the artist actually writes out the script themselves. How to write the Ketubah? There are specific words and patterns that need to be written on the Ketubah according to Jewish law. There is an order that they need to be written in, and there is a specific script. This script includes details of the bride, groom, fathers, witnesses and the location of the wedding. Additionally, the “Mesader Kiddushin”, the rabbi who organizes the marriage ceremony and the signing of the Ketubah, oversees the whole process. A marriage is a sacred thing. It should be beautiful and thoughtful. A couple should spare no expense when buying the Ketuba, or any wedding and marriage materials. Durability and beauty should be two factors every couple considers while shopping for a Ketuba. What is Kiddush & Where Does it Come From? Kiddush is one of the time-tested traditions in Judaism. The cup used in the ceremony is the centerpiece of the Sabbath meal, beautifying the experience into a memorable event. They can come in many shapes and sizes suitable for each person and personality. Kiddush is a short ceremony that is performed to mark the beginning of the Shabbat meals (or day of rest). There are two major meals on Shabbat, one on Friday evening and one Saturday afternoon. Additionally, Kiddush is recited on the holidays. Wine holds a very high status in Judaism and is used on special occasions like weddings, Shabbat and holidays in order to help make the occasion more distinguished. To emphasis the occasions even more, a special cup is used. This is the Kiddush cup and can potentially be made from any material. Traditionally a silver, metal, glass or ceramic cup can be used. The cup should be a vessel that properly shows the respect needed for a joyous occasion which is why it should be made of a higher quality material. Wine is added up to the top of the glass and a short benediction about the current holiday is said. After the wine is drunk, it marks the end of the Kiddush ceremony and the beginning of the meal. Kiddush is typically performed by the head of the household while the members of the family gather around to listen, watch, and then taste the wine. Kiddush is an ancient tradition that has been practiced for thousands of years in Judaism. At many times throughout history wine was typically included into a meal. Especially on special occasions. In order to further enhance the meal, the ceremony of Kiddush was instituted by the ancient Jewish sages at the start of the meal to demonstrate the importance. The Kiddush cup since those time has been a source of pride and honor for the family as they gather around the table. It should be of normal cup size, no larger or smaller, however it is often decorated or engraved with images and text from Jewish scripture. The Hebrew word comes from the word to distinguish or to separate which is appropriate for the role of the cup and the ceremony. Many families even have a family Kiddush cup that has been passed down for a few generations and is of high value. In many ways the Kiddush cup is an accessory which can help express the sentiment and personality of those that use it. The market today contains Kiddush cups that are of a wide variety of colors and sizes. 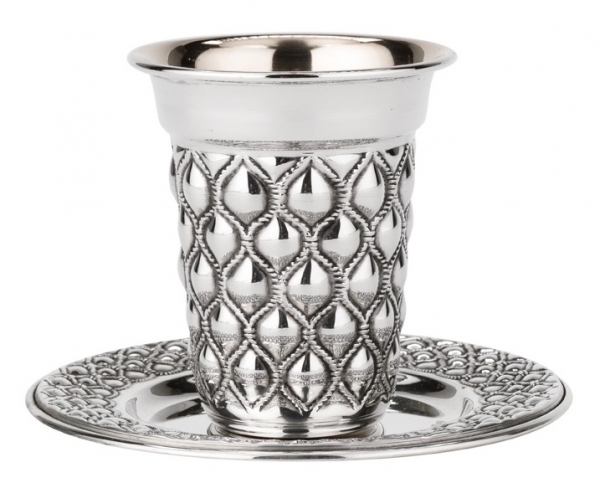 Although Kiddush is only performed on Shabbat or holidays, the use of the Kiddush cup is not restricted to these times. There are several other major life events where people use the Kiddush cup as well. Weddings, bar/bat mitzvahs, and brit milahs are other joyous occasions where people incorporate wine and the Kiddush up. They can be an appropriate gift for these occasions as well. Tallit - What and Why? A tallit is a four cornered garment. Each corner of this garment is accompanied by tassels. These tassels are comprised of a few strings. 4 strings, to be exact. These strings are called Tzitzit. There is a positive commandment in the bible to wear tzitzit on any four cornered garment. Because we don’t always have a four cornered garment on, we wear a tallit to give us the opportunity to gain this positive commandment. A tallit katan literally means a small tallit. This is worn all the time. It resembles a small poncho of some sort. It has four corners and a large hole in the middle, to put the head through. It can be made out of wool or cotton. It can be made out of other materials too, though that should be researched more before trying. Many people wear this at night, too. It is said to bring a very strong protection when worn. Many people who do not usually wear a tallit katan will wear it when embarking on a dangerous or risky journey. A tallit gadol is literally translated as a large tallit. This is worn by men, (and some women, though that is a controversial topic), during the shacharit service in the synagogue. It is worn on other occasions too. Here are some examples. Yom Kippur - Both night and day, to resemble angels. At a person's funeral - Both men and women get wrapped in special shrouds and then wrapped again in a tallit gadol. A chazzan, when leading the congregation, wears a tallit gadol. A person who gets an honor at the torah. A tallit gadol is like a tallit katan, only bigger. It is also missing the giant hole in the center. Reason being, it doesn’t go over the head, rather it goes around like a shawl. That is why it is called a prayer shawl. A tallit gadol is white. It has stripes too, varying in different colors. In the ultra orthodox community, it is customary to wear a tallit with black stripes. In the modern orthodox, conservative and reform communities, the colors go from plain black, to blue and even to all the colors of the rainbow. There are many kinds of material used for tallitot. Today, with technology, they have developed a non slip tallit, designed to stay put when resting on your head. There are different kinds of headpieces for the part that goes on your head. Some people wear a silver crown. Or “atara”. Some people just have a shiny piece of material. Some write the blessing for tzitzit on the headpiece. Wear a tallit! It helps keep you safe, and it looks amazing! Shabbat Candles What are they? Shabbat is the day of rest on the Jewish calendar. It falls from sundown on Friday until sundown on Saturday. During this time Jews from all around the world stop and reflect on their week, spend time with family and friends, attend the synagogue. This is a special time where we attempt to change our actions that we busy ourselves with the days of the week, with school, work, and anything else, and we rest. Like many moments in Judaism there is special ceremony for the arrival and departure. Shabbat candles are the sensational objects we use to help welcome the Shabbat. Shabbat candles can be wax, or oil, and should burn long enough to burn well into the night. The dominant custom is two lights two, and an additional candle for each child in the family. They are popular gifts for weddings, birth of children or any other joyous occasion in life. Shabbat candles are traditional lit by the matriarch of the family. Young girls are often educated as well by their mother on how to light. It is not necessary for boys to light if their mother lights, or for husbands to light if their wife is lighting. Families enjoy gathering around and watching the women of the family welcome the Shabbat with the blessings and actions of lighting the candles. Women light for a number of reasons, but before the time of electricity candle light was our primary source of seeing in the night. When women lit the candles, it allowed for the whole family to have an enhanced experience because of the additional light. Also, light is compared to goodness, which mothers have a special inclination for spreading. Shabbat candles can be lit at various times depending on the custom of the community. The most prevalent custom is 18 minutes before sunset. In Jerusalem they light 40 minutes before sunset. Sunset is the time which lighting candles is no longer permitted, by making the effort to light early it demonstrates our excitement for the beginning of Shabbat. Shabbat candles should be placed in a location where they gain the most functionality. This is usually in the kitchen or the dining room. A very important part of Shabbat involves eating, so naturally a lot of time is spent in the kitchen and at the table. In order to enhance the beauty of the candles they are often places on beautiful candle sticks. 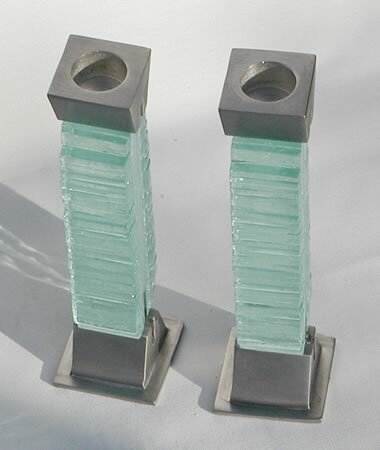 Candlesticks are a fun, expressive way to personalize the experience of Shabbat candles. Like the Kiddush cup traditionally the candle sticks are made of silver or an expensive metal, but they don’t need to be. Glass and ceramic is also a very popular material today. They range from tall to short, and literally any color that can be imagined. No matter the material or size, their beauty can be admired during Shabbat. Why do Jewish men wear a skullcap? A Skull Cap, Kippah, Binnie, Yarmulke, or Jewish Hat.. The Yarmulke is a Yiddish word which means skullcap, or more commonly known as kippa (in Hebrew). This Jewish "hat" is traditionally worn by Jewish men during times of prayer, and for others at all times. It has a unique role in Jewish tradition, because unlike other garments in the Jewish religion it is not mandated by Jewish law. Yarmulkes do not need to be of a certain color, size or design. 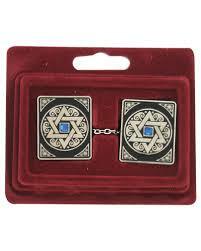 It is one of the traditions that has been a symbol of Judaism no matter what countries or time Jews have lived. In fact, through the years they have taken many different styles to adapt to various cultures and ideologies. Shop and browse our new and best seller yarmulke designs on shtotty.com and be the first to review our products. In Judaism covering of the head is a sign of respect, this differs from many modern cultures where it is considered improper to wear a hat while indoors or eating. There are differing sources as to why a yarmulke became such a dominant custom, but one common understanding is because one should be reminded at certain times that there is a power above you in the world. This helps people to maintain a sense of humility in a time where it is so easy to think we alone are the ultimate power. The yarmulke is a form of expression for Jews to help define their own relationship with Judaism by being able to pick the size of color as we see fit and at the same time expressing our personality. It is not just a form of expression internally within Jewish communities but also externally with the non-Jewish communities. Through periods of persecution the yarmulkes became a stronger symbol that Jews were not willing to give up on their religion and tradition. Even though it was maybe only a custom many Jews choice to wear it proudly rather than discontinue wearing it in public. Today it has grown into one of the most identifiable garments of Judaism. What kind of Yarmulkes are there? It is important to note that a yarmulke is not confined to a certain design of color. Any sort of head covering can be considered a yarmulke. The most famous picture of the 11th century philosopher and rabbi Maimonides is wearing a turban, because in his generation this was the proper form of dress. Today there are several mainstream styles of Yarmulkes. 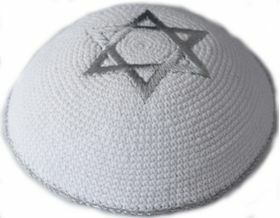 In Israel the Religious Zionist groups tend to wear a knitted yarmulke, of various sizes. The traditional orthodox groups wear black velvet ones. There are colorful cap-like yarmulkes from the Bukharin communities that today are very popular with children and Jews of Sephardic descent. In many tourist shops within Israel designs for nearly anything can be found including cartoons, sport teams, superheroes and even political candidates. In America the more modern groups wear suede, while the reformed groups wear satin. Within the US armed forces camouflage yarmulkes can be found to match the standard issue uniform. Each of these is as valid as the next, and fulfills the obligation of a head covering. Challah Board and Cover - What are they? When someone sees a set Shabbat or holiday table, the first thing they often notice is the challah board and cover as the centerpiece of the table. Two pieces of challah are required to commence the meals on certain days in the Jewish calendar. The Challah board and cover do more than add beauty and elegance to the table but also have very important symbolism and play an important role in Jewish Law. Even more so because nn Jewish tradition the dining table is compared to the altar that stood in the Temple and all products placed on it play a special role. The challah cover plays a vital importance according to Jewish law. There are six different blessing that are said on six different categories of food according to the Jewish law. Each has a different level of importance and priority. This usually becomes a consideration when there are multiples foods to be eaten in the same meal, there is an order of which blessing, and food should be eaten first, second, and so on. At the very top of this priority is the blessing that is said on bread, and after this is said, it is considered a proper meal and no other blessings are said on the remaining foods. However, there is one exception, and this is on days when Kiddush is said, Shabbat and holidays. Kiddush includes the blessing on wine, which is less important usually than the blessing over bread, but because of the uniqueness of the day, is actually said first. In order to help to “not embarrass the challah” by saying the wine blessing first, the challah is covered by a beautiful cloth cover, so it is not visible. Challah boards have become a modern form of artistic expression. 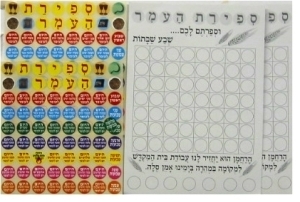 It is common for them to have inscriptions and images depicting Shabbat of themes from the Torah. Similar themes and texts can be found on the challah cover, which is usually clothes, and embroidered with various colors. Newer versions of the Challah boards can be unique shapes, with additional features to catch bread crumbs, and even that can convert into serving bowls. A mezuzah, which translates as doorpost from Hebrew, is a small scroll that is placed on the door frame. The scroll is made of a kosher animal hide that is similar to that in the tefillin boxes and the Torah scroll. A trained expert scribe writes several verses from the torah onto these scrolls including Deuteronomy 6:4-9. This verse contains the famous verses of the Shema, which explains “And you shall inscribe them upon the doorposts of your house and upon your gates.” From here is where the great rabbis in Jewish history determined that these verses should be written down and attached at our doors. To help protect these scrolls we encase them with a small beautiful box called “bayit” in Hebrew, or “house”. Where and when do we use a mezuzah? A mezuzah should be attached on every door frame on our property except for bathrooms and very small rooms, like closets. Included in this are internal and external doors, storage sheds, and gates. In order to be classified as a door frame in Jewish tradition it must contain the lintel, which is on top piece connecting the two horizon door frames. A mezuzah should be placed on the right side, upon entering the room, and on the top 1/3 of the frame so it should be about eye level. The mezuzah should be affixed as soon as possible if the residence is in Israel, and in the diaspora it should be applied within the first 30 days. If it was not done within this time, it can be done anytime thereafter. Why do we use a mezuzah? A mezuzah is one of the biblical mitzvot or commandments in Judaism. On a more basic level that should serve as a reminder whenever we exit or enter our residence of our responsibilities as a Jew. That we should be honest, caring, and reflect the values the torah speaks of. Historically, even during times of persecution a mezuzah has been an immense form of pride. In the world today, some of the ancient Jewish sites in Israel like in Hebron and Jerusalem or the diaspora like Europe and North Africa, all of the Jewish neighborhoods and buildings still contain their mezuzot or marks where the mezuzot once were. There is even a standing joke that a mezuah is a “Jewish doorbell” because they are so common at the front door to Jewish homes. Why do we put the mezuzah in the box? 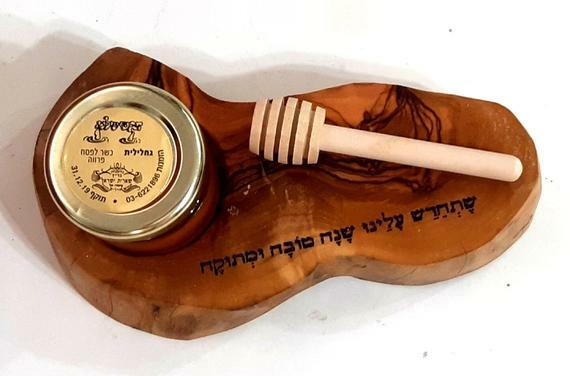 The box in which we keep the mezuzah as mentioned is called a “bayit.” Technically they are not required to say the blessing when affixing the scroll and have a kosher mezuzah. But, they are a great idea. Although there are many customs in the Jewish world, few customs pertain to the “bayit”. Nearly any imaginable “bayit” can be found. Glass, metal, ceramic, solid, clear, colorful, literally anything. The important characteristic to look for is that is it large enough. Most mezuzah parchments range from 10cm to 20cm and “bayit” should correspond. Tzedakah is the Hebrew word for charity. In truth, it is much deeper than charity, because of the root of the Hebrew word which comes from the same word as righteous. Unlike the English word charity which usually is optional, tzedakah is viewed as an obligation to support certain individuals and institutions. It is considered so central to Judaism because there is a core idea that our actions, shape our ideas, and there is a unique relationship between our thoughts and our deeds. We are required to give tzedakah, at the most fundamental reason, because Judaism teaches that money is not ours to begin with. We have been allocated certain funds, in order to make good use of them, whether it be to educate children, provide shelter and food or to perform other mitzvot. We have the unrestricted power to help those in need and uplift their position in life. This can be done assisting them with Tzedaka. The obligation is to give 10% of one’s income. This is easiest (on the giver) not to do all at one time, so small coin boxes have become prominent in store, synagogues, and homes. Parents often give their children a few coins, so they can develop the habit early in life, and feel a sense of community and support for those around them. Who can we give Tzedakah to? Tzedakah can be given to just about anyone, there is little room for error. The purpose or use of the tzedakah should align with our own values and the values of the torah. If a certain amount of tzedakah has the potential to be given, then there is a hierarchy of who it should be given to. Ideally It should be used to assist those closest to us. This means the local community, Synagogue, schools, etc. Supporting those that are very involved in the Jewish world, such as students and teachers, should be given to as well to improve their condition. Those in need financially or materially clearly take a high priority as well. Funds can be allocated for their bread or wine in their holiday meals, Shabbat candle or any number of expenses that arise in the observance of the mitzvot. When do we give Tzedakah? Tzedakah can be given at any time, however certain times are more appropriate than others. Many have the custom to donate money just before they pray throughout the day, and many women give at the time of lighting Shabbat candles. Tzedakah is also pledged in honor of the loved ones that we have lost, and to honor special occasions like bar mitzvahs. To act as a reminder at these times, tzedakah boxes should be easy to access so giving does not need to be a great challenge. The best way is to give inconspicuously, so a few coins dropped into a box can be only between yourself and your creator. Many homes keep boxes on their tables, mounted by the door, and even in the bedroom.